This is nice embroidered handbag executed from soft leather. It is very practical material for everyday use: if it became dirty you may just wipe it with a damp cloth. 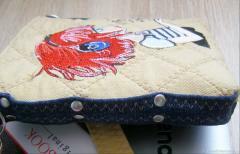 It is added by convenient zip at top part and original embroidery sample consists of some words. 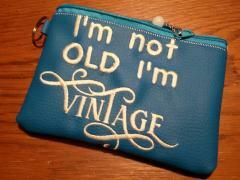 I'm not old I'm vintage free machine embroidery design is cute joke suitable for this work piece. This is simple but original little handbag made by Johanna Hasselbrink. It can be used for keeping little accessories or even as wallet for coins. It is made of monochrome color scheme and has convenient zip. 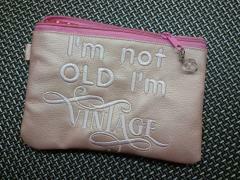 Its front side is decorated with I'm not old I'm vintage free machine embroidery design. It is nice joke which makes this work piece stylish part of your look. This is pretty interior cushion which can be best gift for beloved person for Valentine’s day. This work piece is decorated with names of loving couple and many little hearts. These inscription is added with declaration of love made by bright thread. Love you machine embroidery design 3 can be made even by beginners in embroidery but final result us so pretty and cute. 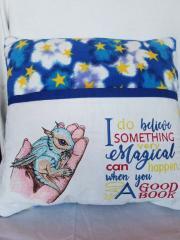 This is bright and interesting cushion which has some magic in its design. Maybe it is inspired inscription which is able to make any child to love books. But more likely it is Dragon in my hand embroidery design which reminds us about legends and tales from our childhood. Please note well elaborated color scheme of this work piece which associated with star sky. Great fantasy world in your room. This is pretty embroidered cushion executed in gentle shades. It also has interesting composition based on Young ballerina embroidery design. Originally it used quite calm color but author changed this scheme making her ballerina more bright. She also added it by printed fabric with picture of splendid roses and motivating inscription. On this cushion its owner will see fabulous dreams. For loving our girls. This is funny and original textile accessory for kitchen which is not just useful thing. It shows grate taste of humor of its owner and can raise its mood at any day. 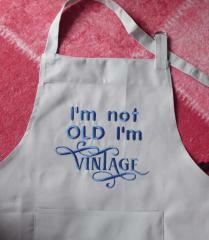 I'm not old I'm vintage free machine embroidery design is nice sample for this apron which suit it at its sense and even size. It looks quite simple but very stylish. 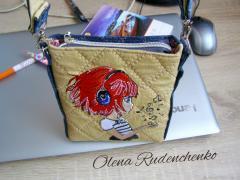 This is little handbag which is full of sense. Its simple light surface is decorated with embroidery sample which reminds us about true values in our life. 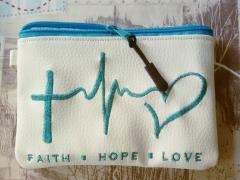 Faith hope love free embroidery design is just three words which are most important for many of us. They are added by stylized cardiogram. Image is executed by same color as zip at top part of handbag. 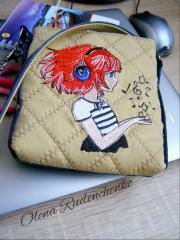 This is little handbag with pretty design elaborated for girls only. It is obvious even from embroidery sample used for its decoration. It is Just a girl free machine embroidery design. Thematic inscription is added by stylized picture of closed girl’s eyes with fluffy lashes. Picture is executed with contrast color which looks so impressive on bright leather of this bag. This is nice set of two little handbags. Both of them are executed from light leather with almost identical design. 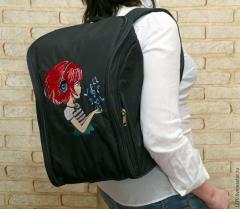 It is based on Be happy free machine embroidery design. Embroidery sample is good reminder about value of each day of your life. The only differences between these bags are forms of clasp on zip and color scheme. That set is nice as gift or can be used by author herself. This is pretty set of embroidered towels prepared for one holiday. It is famous Mother's day when children celebrate their moms and say them about their love. These are some unusual ways to do it. 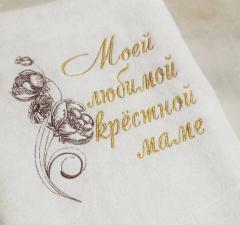 They are embroidered towels embellished with thematic inscriptions. 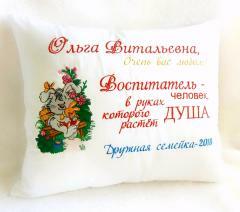 For example one of them is decorated with Happy Mother's day embroidery design. You may use to make this nice work piece for your mother too. 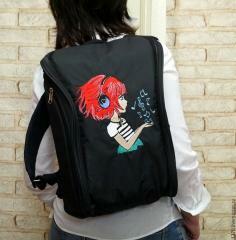 This is cool city backpack which is suitable for both boy and girl. It has spacious form and made from practical dark fabric. 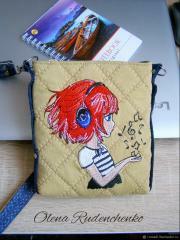 But it is not boring at all: its front side is embellished with Where words fail music speaks 2 embroidery design. This picture shows role of music in young people’s life very well. Sometimes we are in bad mood but favorite song is able to return us to life. 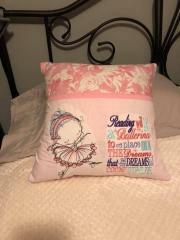 This cushion is memorable souvenir prepared by its author for beloved friend. It is added by warm wishes and decorated with border made of star fabric. 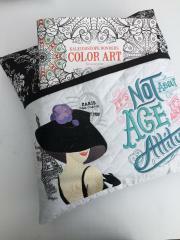 But its main highlight is Vintage scissors and ribbon 3 machine embroidery design. It is interesting composition in retro style executed with just contour of one color. It looks like complex combination which is interesting guess for its owner.